It happens. You’re driving safely down the highway, and suddenly the little red light on your dashboard pops on. There’s no need to panic, but your vehicle is telling you something about it’s condition. Pay attention! Something’s going wrong under the hood. Croce’s Transmission Specialists in Norwalk, CT should be your next stop. Our ASE Certified techs use state-of-the-art testing equipment to perform top-of-the-line check engine light services. Drivers should recognize that there are two types of check engine lights alerts. The first type will be an early alert that gives you time to schedule an appointment with Croce’s specialists. This alert will remain solid until the problem worsens. Sometimes, this will trigger the second type of alert, which is blinking to indicate an emergency. At this point, you need to cease driving your vehicle. Not only is it unsafe to operate, but you will also be causing further damage to your vehicle. Before you end up on the side of the road, get our expert technicians on the case. We make sure you always drive away at peak performance. Did Your Check Engine Light Come On?–We’re Here To Help! 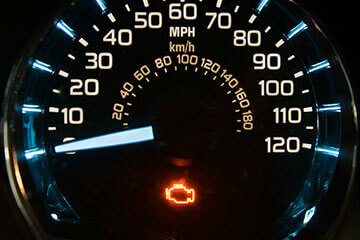 There’s no telling what’s causing your check engine light to come on! So you need the professionals at Croce’s Transmission Specialists. We perform a better quality of check engine light service. Our vast experience and sophisticated equipment only complement our superior customer service. Responsible drivers come to Croce’s in Norwalk, CT as soon as possible after a check engine light appears. They know our team can get to the bottom of a check engine light. After accurate testing and diagnosis, we’ll perform necessary auto repairs. Our customers come here first because they want answers. We’re here to make sure they get them done efficiently. The problem could be anything from a loose gas cap to a major engine or transmission issue. Get the right diagnosis from the right technicians, using sophisticated equipment. You’ll end up with fully-enhanced vehicle. Our team is here to help, don’t delay! The sooner our techs and our testing equipment gets to analyze your vehicle, the sooner you’ll be back to safe and confident driving. Give us a call today at 203-989-2525 to finally get that check engine light checked out. If you’d like to schedule it right now, just use our convenient online schedule system. Live nearby? Feel free to stop by next time you’re in the area.